After the jump, check out a catchy new Penn Rap video that some Penn undergrads sent me. 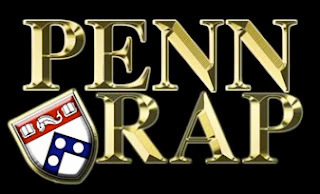 Lots of great Penn references, plus some awesome Penn bling. Favorite line, "I'm a Jew like one in three of you." By Lizzie Sivitz and Zach Tomasovic (Cashmere Sweater Comedy). Music by Esther Baranov. Filming by Ryan P.C. Trimble and Alex Rodrigues.